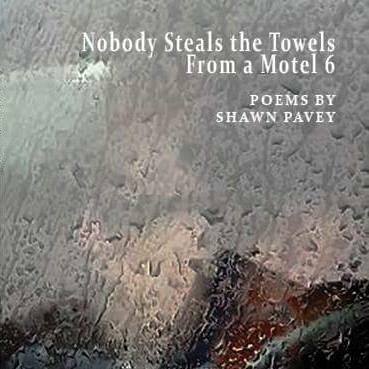 Shawn Pavey has delivered newspapers, mowed lawns, bagged groceries, cut meat, laid sewer pipe, bussed tables, washed dishes, roofed houses, crunched numbers, rented cars, worked in hotels, worn an apron at Kinko’s, and been paid to write everything from résumés to music reviews. Currently, he earns a living as a Technical Recruiter in Mission, KS where he lives with his fiancée and three worthless but adorable cats. He is the author of Talking to Shadows (Main Street Rag Press, 2008) and Nobody Steals the Towels From a Motel 6 (2015, Spartan Press), Co-founder and former Associate Editor of The Main Street Rag Literary Journal, and a former board member and officer of The Writers Place, a Kansas City-based literary non-profit. His poems, essays, and journalism appear in a variety of national and regional publications. He’s hosted poetry readings in bars, coffee shops, haunted houses, bookstores, libraries, front porches, seedy motel rooms, and abandoned warehouses. A graduate of the University of North Carolina’s Undergraduate Honors Creative Writing Program, he likes his Tom Waits loud, his bourbon single barrel, and his basketball Carolina Blue.